LA is often thought of as the home of the stars. While it is a common occurrence to find actors and actresses walking the streets, there’s more fame behind this city than Hollywood’s finest. The area has long been a pilgrimage for writers of all facets, with apartments in LA acting as a home away from home for some of the most famous names of the 20th century. From Robert Frost to Joan Didion an Charles Bukowski, some of the greatest minds to ever pick up a pen have left their mark on the city. To get a taste of the author-heavy scene in LA, check out these top-rates literary destinations. Bukowski’s portrait hangs over the register of this cozy bar on Hollywood Boulevard, perhaps still having a drink in spirit. This was one of the writer’s favorite hangouts during the 1970’s. It is here that Bukowski mulled over the pages of his works after singing with Black Sparrow Press. Stopping in to admire this historic location is simple. The bar is simple. It’s still open! If you’re a fan of the author, then why not grab a boilermakaer (Bukowski’s favorite drink) and share one of the seats he sat at night after night? Now a spiritual organization that offers guests the ability to commune with nature, this location used to be the home of famous author Joan Didion from 1966 to 1971. Didion and her husband used the 20’s-style home to throw extravagant parties and the surrounding cultural hub of L.A. as inspiration for their works. While you can’t take a tour of the author’s old home, you can go on a “spiritual journey” with the Shumei on Saturdays. It’s an excellent way to see the artist’s home, and followers of the Shumei way are more than happy to talk about her work. 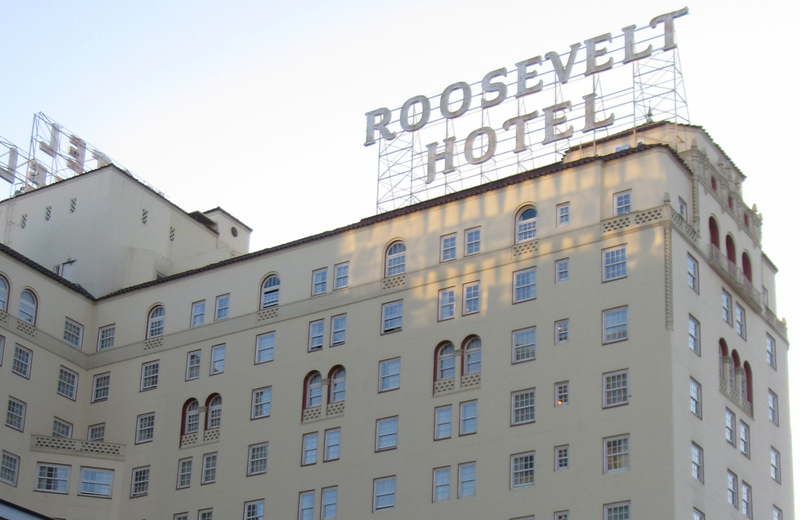 This hotel served as temporary home and watering hole to William Faulkner during his brief stint in Hollywood. The author may have loathed his time Los Angeles, but you can still sit in the same seat he did while sipping mint juleps. Plus, plenty of well-known and wealthy members of the city frequent this location. Since 1919, this restaurant has served as everything from a bar to and office for boozy writers like Fitzgerald, Hemmingway, and Gore Vidal. With the Screen Writers Guild right across the street and the Stanley Rose Book Shop a few doors down in the 1940’s, you can imagine just how many authors passed through Musso and Frank’s doors. You can stop in and have a drink where these great literary minds once sat at anytime (expect Monday). To eat, you’ll need a reservation for lunch or dinner. The home where Bukowski started his professional career is a protected Historic-Cultural Monument in Los Angeles. This is where he hoarded never-published poems and writings while he worked at the nearby post office. It also happens to be the place where John Martin, his publisher, initially worked with Bukowski to get his poems published. While you can’t step inside of this monument, you can take a picture from the sidewalk. It doesn’t look like much, not even in the slightest, but it’s where some of his greatest works began. Dozens, if not hundreds, of writers have stayed in the rooms at the Chateau Marmont. Dorothy Parker and Eve Babitz are two of the most popular names to call this hotel their home. The Garden of Allah hotel used to sit across the road, acting as a part-time home for the likes of F. Scott Fitzgerald and Robert Benchley. This literary hub is still open today, and you can book a room for an exorbitant price. For the more frugal, dinner reservations at their restaurant and bar are far more affordable. This legendary locale was a temporary home and watering hole for some the area’s greatest authors. Gore Vidal, Fran Lebowitz, and Eve Babitz loved to hang out in the Cabana Café as well as the coveted Polo Lounge. Even Bret Easton Ellis frequented the bar back in his early days. While you can always get a drink at the bar where numerous authors found their inspiration, dining in their favorite hangouts is highly recommended. With a reservation, you can enjoy both the Cabana Café and Polo Lounge. Charles F. Lummis was a Californian at heart, so much so that he built his own home by the Arroyo Seco. This castle-like structure and the grounds around it have since been turned into a park where aspiring authors go to find inspiration. You can enter the park on weekends from 10 a.m. to 3 p.m. While you cannot go inside of the Lummis home, you can marvel at the stonework just inches away. Plus, the gardens are a beautiful sight. While locations like Chateau Marmont and The Hollywood Roosevelt were an artist’s ideal way to live in luxury a few decades past, Atelier luxury apartments are the new standard for high-end living in Los Angeles. Offering residents front row seats to the vibrant transformation of Downtown LA, these homes place artists next the muses of a historic and contemporary metropolis. Designed by Solomon Cordwell Buenz, the building itself is a work of art. Thirty—three stories of chic glass offering 360-degree views of the city, while modern finished provide envious dwellings. German hardwood-style flooring, Italian cabinetry, and Bosch stainless steel appliances are just the tip of the iceberg. Each residency, like any of Bukowski’s poems, offer a rich and deep appeal. Within Atelier, residents find every need met by a variety of resort style amenities. A skyline terrace complete with splash pool offers the ultimate in relaxation, the expansive fitness center features state-of-the-art equipment, and the business lounge with its conference rooms caters to the entrepreneur. Guests are easily entertained via the game terrace or clubroom, while services from the 24-hour concierge allow you to forget the small details and focus on what matters. Atelier isn’t another LA address. It is the premier destination of Downtown, redefining luxury living for a modern age. Welcome to your blank canvas in the city. Welcome home.